In the first edition of Dogwood City Regrets, I lamented the dearth of apes that I managed to put into my month-long journey through a comic book setting. And he's pretty much exactly what you think he is. Turns out he's looking for revenge on the Strawhan Gang, a bunch of Old West bandits who murdered his owner. As his name implies, he achieves this using a six-gun. So simple. So perfect. 6GG, as he lets me call him, ultimately didn't make the cut for Dogwood City due to the fact that I shied away from Western characters that wouldn't have a huge impact on the present. He also appeared as a feature in the British story paper The Wizard, while I focused on more traditional comic book characters. However, he's definitely filed away for the day I decide to explore the Weird Western history of Dogwood City. I suppose I should have been familiar with this ape, as he apparently had a couple of comic book appearances in 2013, including one from BOOM! Studios. I somehow missed those, or...if I saw them...didn't get the historical significance at the time. I'd love to know how they are, if any of you have read them. 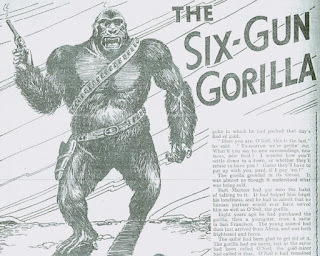 By all means, check out Six-Gun Gorilla on the PDSH Wiki and especially at the website of geek extraordinaire Jess Nevins, who very kindly scanned and posted the serial. Yeah, this guy is pretty amazing. I hope he gets more love. Thanks for stopping by!